The lock and key to most people is a mysterious object, we put all our trust and faith into it when we lock the front door or lock up the safe. Even though we religiously follow this ritual, often many times each day, few are fully aware of what mechanical forces have been activated, but we have fulfilled a very fundamental psychological need. We go about our daily routines in the knowledge that our homes and possessions are safe. We have performed the ritual of locking up. Archaeology is gaining in popularity. TV programs and films, like, on the one hand Time Team and on the other Indiana Jones have done much to capture the imagination and inspire. In the field of Industrial Archaeology or Industrial History, Locks and Keys are no less worthy of attention. In fact it’s sometimes said that the craft of the locksmith is the second oldest profession! Certainly man’s possessions have always been coveted and therefore the need to keep them secure has been a necessity from the earliest times. The study of historical or antique locks and keys is a specialised sector of Industrial Archaeology. Not only does it look at the various ways in which a mechanical device achieves its aim but also says something about the basic need on the one hand to protect and secure property and possessions, but it also reminds us of another, darker, aspect of the human instinct. 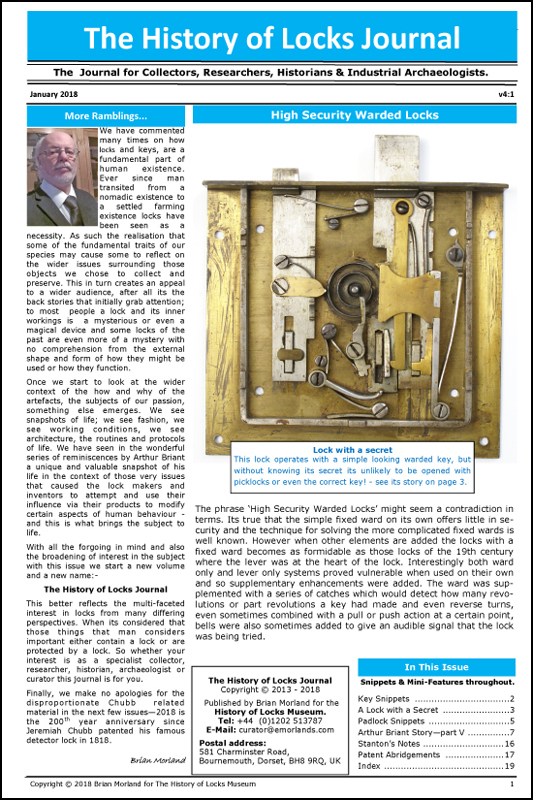 These fascinating aspects are what these virtual History of Locks Museum pages are all about and will hopefully bring some of the mysterious objects of the locksmiths' art alive. To this end the project not only attempts to gather and display the beautiful and ingenious items of metalwork but also books, manuscripts, catalogues, and other printed matter on the subject. We all know the analogy of a grain of sand doesn't make a beach... but hopefully with enough snippets of information a more complete picture can be built, understood and enjoyed. We especially acknowledge and are grateful to the many individuals that have helped and contributed. Please feel free to make contact via the e-mail links provided with enquiries. Alternatively you are welcome to view, join and take part in one of our cluster of lock related forums at Antique-Locks.com or The History of Locks Forum or even COLTi if you are a working locksmith looking for information on modern locks. We have already stated that it seems to be a fundamental human need to preform the ritual of ‘locking up’. It then follows that the study of locks tells us a lot about human instinct. We can also marvel at the mechanics built into an incredible variety and diverse range of locking devises, from belt buckles, wine bottles and caskets through to locks for homes, business and the highest grade safes, depositories and vaults and the sometimes intriguing and complicated rituals associated with their use. Establish and maintain a permanent home for the collection, a Museum of Locks and Locksmithing. In today’s world everything needs the resources to support the idea or project. Our mission is no different. The on-line resources we provide, as well as the future aims, especially the permanent home for the collection, all requires funding. Therefore like most organisations we have the dedicated commercial activities of Morlands and therefore as someone with an interest in locks and keys hope that on occasions, and when you have a need, your patronage helps serve the bigger museum project.